The DAILEY name is generally considered to be of Irish origin, but immigration records at Ancestry also point to Great Britain and Germany as ports of departure. Due to lack of my research on this family line, it is unknown at this point from where my children's DAILEY roots originated. Alternate spellings include DAILY, DALY, and DALEY. If Irish, the origins are an Anglicized form of Gaelic Ó Dálaigh, meaning "a descendant of Dálach," a personal name based on dál (modern: dáil), which itself means "meeting" or "assembly." The Republic of Ireland's parliamentary body is called the Dáil. Ahnentafel #54 - William DAILEY (c. 1794 - bef. 1880) - a variety of records indicate William's birthplace to be Indiana, Ohio, or Kentucky. In 1826, he married Hulda REDENBAUGH (c. 1808 - 1890), daughter of German immigrants. It's not known where they married, but the first of their 14 known children were born in Rushville, Rush Co., Indiana. In 1840, the family was found in Scott Twp., Montgomery Co., Indiana, and by 1849 they were located in Green Twp., Parke Co., Indiana. In 1851, however, they were in Wapelo Co., Iowa and in 1853, Fremont Co., Iowa. More research is definitely required on this family group! Ahnentafel #27 - Mariah Emily DAILEY (1849 - 1935) - born in Parke Co., Indiana, she appears to be the youngest surviving child of her parents. In 1868 in Thurmon, Fremont Co., Iowa, she married George TURK, a.k.a. Henry LYTON (c. 1836 - 1874). They had two children and Mariah was pregnant with the third when George/Henry died. Mariah then married German immigrant John Christopher KLINDER (1850 - 1933) the following year. They had six more children and eventually relocated to Hydro, Caddo Co., Oklahoma, where they lived out the rest of their days. Ahnentafel #13 - Emma Alice LYTON (1874 - 1959) - born in Thurman, Fremont Co., Iowa, she was raised by her mother and step-father in that community with her six younger half-siblings. About 1891, she married Albert Francis CHAPLIN (1868 - 1946) in Iowa and begin a life of six children and constant migration: Nebraska, Iowa, South Dakota, Colorado, Idaho, Oregon, and Washington, with travels back to Iowa, Kansas, and Oklahoma. She died in Portland, Multnomah Co., Oregon. Ahnentafel # 6 - Forrest "Frank" L. CHAPLIN (1901 - 1977) - born in Yankton, Yankton Co., South Dakota, he came out West in a covered wagon as a boy with his family. He married Leona Mary MARTIN (1906 - 1993) in 1925 in Vancouver, Clark Co., Washington. They had three children. Frank died in Othello, Adams Co., Washington. Disclosure: I am an affiliate for Amazon.com, and as such, receive compensation for products advertised on and linked from this blog. As I mentioned last week, due to the amount of traveling I'm doing this month, the August Scanfest has been postponed. We will resume Scanfest on Sunday, September 29th, from 11 AM to 2 PM, PDT. If you'd like to stick with the routine, I recommend the Sunday ScanDay group on Facebook. They meet every Sunday for an hour at 1 PM, Pacific Time. It is a closed group (to prevent spammers), but simply apply to join the group. Of course, you must have a Facebook account. I'm looking forward to "seeing" everyone in September! 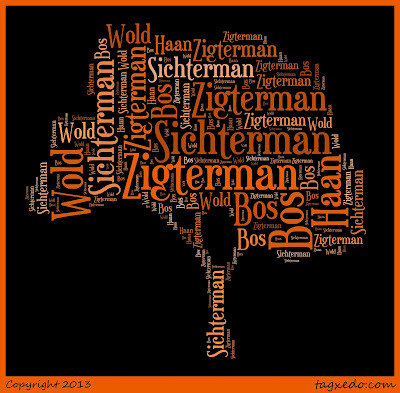 ZIGTERMAN is one of my maternal step-grandfather's surnames. The spelling was anglicized to SICHTERMAN in the United States in the late nineteenth century. The family line comes from the Province of Groningen, in the north of the Netherlands. While I have not yet been able to determine the translation of the word, it appears to be an occupational surname. 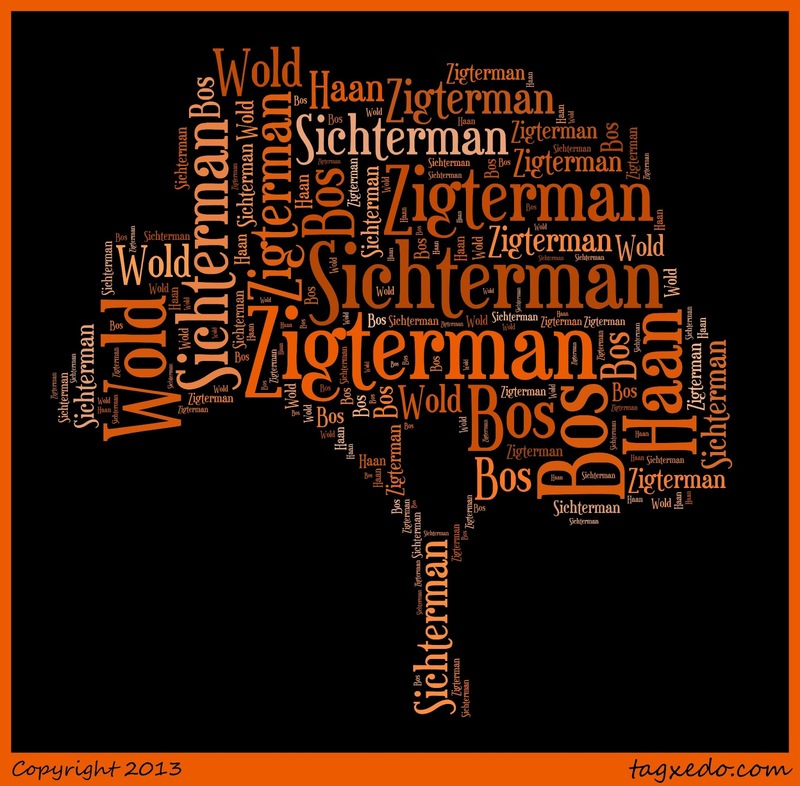 The earliest ZIGTERMAN ancestors I can find originated in the province of Groningen, in the village of Bierum in the municipality of Delfzijl. In 1879, my step-2nd-great-grandparents, Melle BOS and Trientje ZIGTERMAN immigrated to Western Michigan. Ahnentafel #54C - Klaas ZIGTERMAN (1823 - 1870) - born and died in Bierum, Delfzijl, Groningen, the Netherlands, he married Anje WOLT (b. 1829) there in 1854. They had six known children. At least two of their children, Trientje ("Catherine") and Zigert ("Silas") immigrated to Western Michigan. Ahnentafel #27C - Trientje "Catherine" ZIGTERMAN (1856 - 1835) - born in Bierum, she married Melle "Millard" BOS there in 1877. They immigrated to Western Michigan in 1879 and had three children. The first was born in the Netherlands, the second in Missauke Co., Michigan, and the third in Ottawa Co., Michigan. After Melle's death c. 1888, Trientje married Pieter BARSEMA in 1889 in Ottawa County and had four more children. She died in Grand Rapids Twp., Kent Co., Michigan. Due to the amount of traveling I'm doing this month, the August Scanfest, originally scheduled for August 25th, has been postponed. We will resume Scanfest on Sunday, September 29th, from 11 AM to 2 PM, PDT. 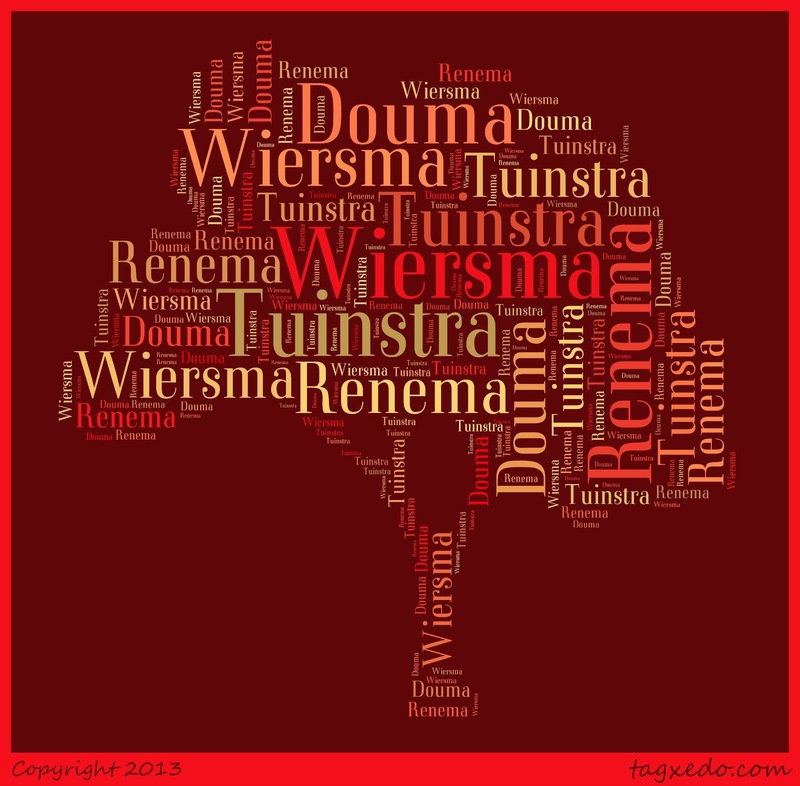 WIERSMA is a Frisian "clan name," basically meaning "the family of Wier." Frisians are an ethnic minority in the north of the Netherlands, congregated mainly in the provinces of Friesland and Groningen. In 1811, Napoleon, who ruled the Netherlands, required all the residents of that country to register a surname. Before then, the people of the Netherlands generally used patronyms, although some did have surnames. 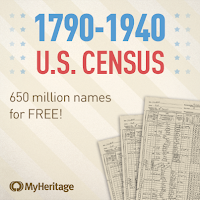 Many took on occupational, location, or clan surnames in 1811. It's not clear to me why my widowed ancestor, Jeltje Harmens, registered the surname WIERSMA for herself and her children, nor am I sure whether the WIERSMA surname was a reflection of her late husband's family or her own. She is referred to by this surname for the rest of her life, which was unusual, as most women in the Netherlands continued to use their father's surname after marriage. Her husband, Anne Klaases, is referred to posthumously with the WIERSMA surname in at least one of his children's death records. 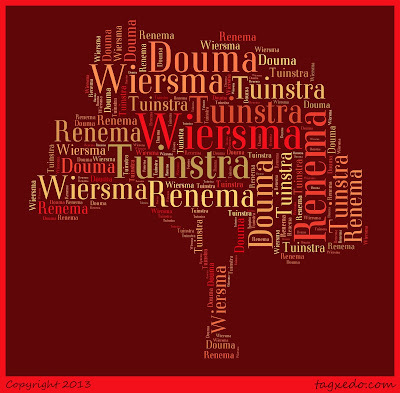 Thus, it is possible that the WIERSMA clan name could have been one from either spouse's family. Ahnentafel #216 - Anne Klaases WIERSMA (b. c. 1776 - 1809?) - despite the name, this is a male ancestor. Anne is pronounced "AH-neh" and would be the equivalent of the English "Andrew." He was married to Jeltje Harmens. In 1811, after she was widowed, she registered the family surname with the authorities in Sneek, Friesland, the Netherlands, and used the surname herself (unusual). They had five known children at that time. Ahnentafel #108 - Jouke Annes WIERSMA (c. 1805 - 1853) - He appears to have spent his entire life in the municipality of Wonseradeel, Friesland, the Netherlands. He married Doedtje Wijbrens DOUMA (c. 1801 - 1837) there in 1827. They had seven known children. Ahentafel #54 - Wijbren Joukes WIERSMA (1831 - 1909) - My immigrant ancestor was born in the municipality of Wonseradeel, Friesland, the Netherlands, where he married Akke Dirks RENEMA (1832 - 1882) in 1852. They had perhaps 17 children, including two sets of twins. Between 1882, when Akke died, and 1884, when he appears as a witness to his daughter's marriage in Grand Rapids, Kent Co., Michigan, Wijbren immigrated to the United States. He died in Wyoming Twp., Kent Co., Michigan. Ahentafel #27 - Doetje WIERSMA (1854 - 1916) - Also an immigrant ancestor. Born in Zurich, Wonseradeel, Friesland, the Netherlands, she married another Frisian immigrant, Geert Aukes TUINSTRA (1851 - 1928) in 1884 in Grand Rapids, Kent Co., Michigan. They had 10 children, including a set of twins. She died in Grand Rapids. I'm Going to the Totem Raising! If you have friended me on Facebook, I'm sure you can't help noticing my many posts about the upcoming Totem Raising I'll be attending this weekend in Klawock, Alaska. Perhaps you're wondering what the big deal is. You've probably also never heard of Klawock (Kla...what?)! Klawock, an incorporated city of 850 people, is located 56 miles west of Ketchikan, in Alaska's Southeast Panhandle. The original village was located on Klawock Island, just off Prince of Wales Island, the third largest island in the United States after Kodiak Island in Alaska (where I happened to be born) and the large island of Hawaii. 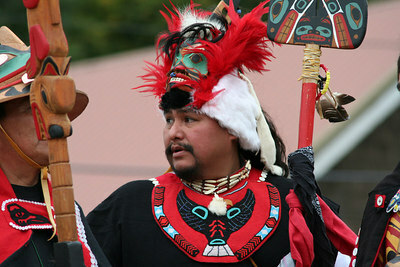 Prince of Wales Island was originally inhabited by the Tlingit tribe of Native Alaskans, and later also inhabited by the Haida tribe. In the 1700s, Russian, British, Spanish, and French explorers and sailors charted the area, and the many languages are reflected in the location names. 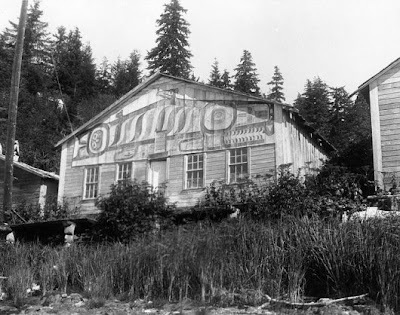 Klawock was originally a summer fishing camp for a particular group of Tlingits who normally wintered at the north end of Prince of Wales Island in the sheltered village of Tuxekan. The fishing camp's location was chosen because of where the salmon left the salt water and entered the Klawock River to go upstream to spawn. In 1868, a trading post and salmon saltery were built in Klawock, and in 1878, Alaska's first salmon cannery was erected there. Klawock eventually became the permanent community, and Tuxekan was abandoned. Salmon can from the first cannery in Alaska, in Klawock,. Hand soldered and labeled, ca. 1890s. North Pacific Trading and Packing Co. 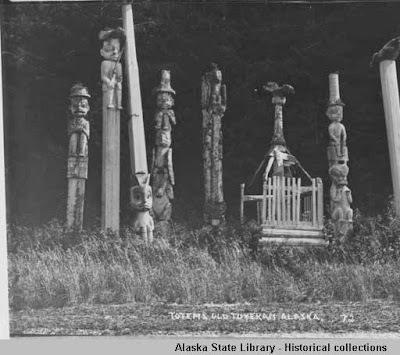 Image from Alaska State Museum. In the 1930s, the Civilian Conservation Corps hired a number of native carvers to replicate the deteriorating totems at the abandoned village of Tuxekan. Totems at Old Tuxekan, 1910. Alaska State Library. 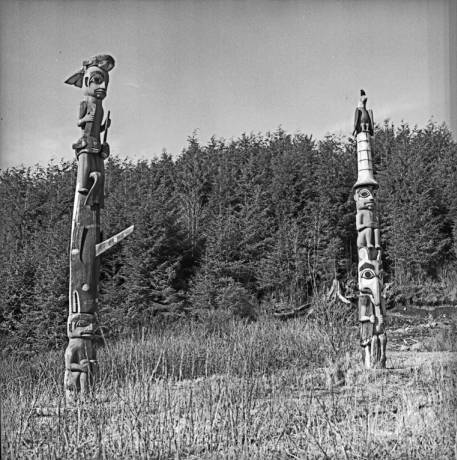 Twenty-one poles were carved and erected in a totem park on top of a hill in Klawock. Each totem belongs to a particular clan and has a legend depicted on it. Klawock Totem Park, 1967. 1st generation of poles. Alaska State Digital Archives. 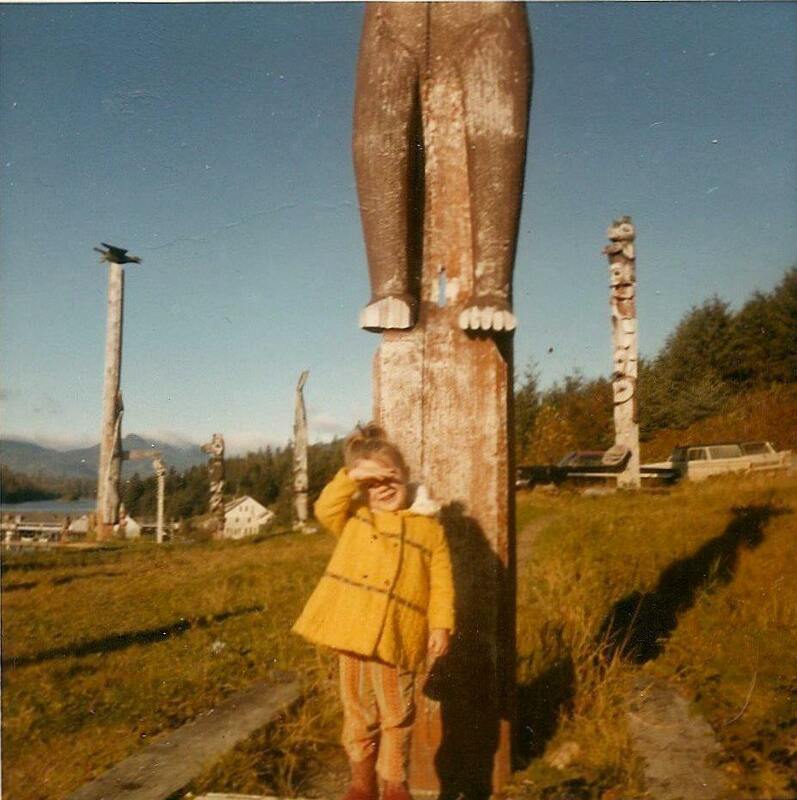 Because of the climate in Southeast Alaska (160-180 inches of rain per year), the totems only last about 40 years. In the 1970s, shortly after my family moved to Klawock, the second generation of poles was raised. Miriam Robbins, Klawock Totem Park, September 1971. Noticing the broken toe and faded paint on this bear totem, I believe this also is a first generation totem. My family was informally adopted into the tribe by Katherine (Skan) Rowan. She made the dress and blanket I'm wearing in the photo below. The Fish Hook Dance. 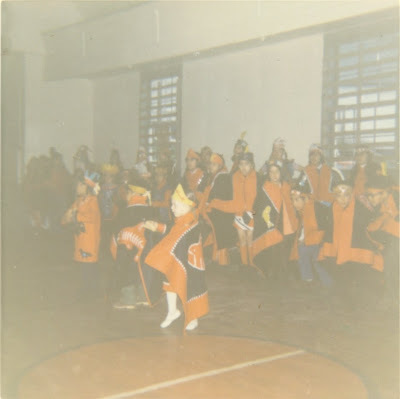 Alaska Native Brotherhood & Alaska Native Sisterhood Hall, Klawock, Alaska, September 1972. Today, Jon Rowan, Katherine's grandson and my native "brother," is the cultural education teacher at the high school. He has trained the high school students to carve the third generation of totems. A few have been erected nearly every summer the past few years. This weekend, the last five poles will be raised of the third generation. They will last for another 40 years. The town has been preparing for months for the three-day celebration!Today, Jon Rowan, Katherine's grandson and my native "brother," is the cultural education teacher at the high school. He has trained the high school students to carve the third generation of totems. Nearly every summer the past few years, a few more replications have been erected. This weekend, the last five poles will be raised of the third generation. They will last for another 40 years. The town has been preparing for months for the three-day celebration! I'm excited to return to my hometown after an absence of 34 years! In addition to the totem raising, the Dog Salmon Panel will be on display in the high school gym. In the early 1940s, this panel, which originally fronted the Dog Salmon Clan House in Tuxekan, disappeared and mysteriously surfaced at the Smithsonian's National Museum of the American Indian. It is believed that a non-native was responsible for its removal. When it was recently removed from storage in 2001, it was recognized to belong to the clan. It was repatriated to the community just one month ago. I look forward to seeing it for the first time. Dog Salmon Screen on front of clan house, Tuxekan. University of Washington Library. So what does this have to do with genealogy? Because I grew up in a culturally rich environment, my parents recognized the importance of teaching me my own heritage. I firmly believe that my interest in genealogy and history was nurtured by my Native Alaskan community, Tlingit cultural classes at school, and Dutch heritage celebrations and family history at home. 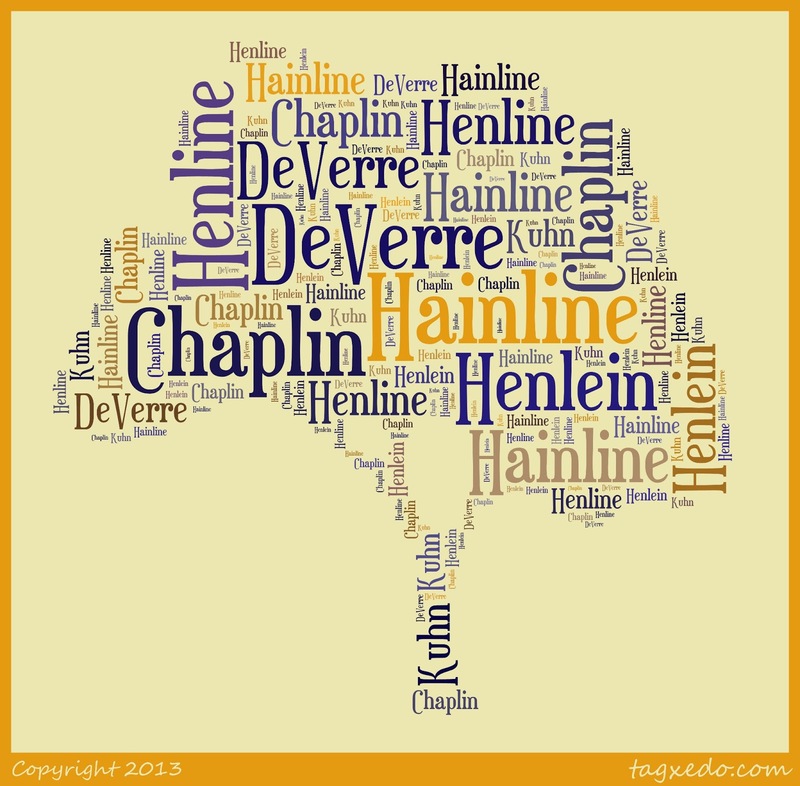 The HAINLINE name originated as the German HENLEIN. This family was located in the area known as the Palatinate, or Pfaltz, Germany. Protestants from this area emigrated to North America and other areas to escape religious persecution, and were called "Palatines." It appears the HENLEIN family emigrated in the late 18th century with a large number of other Palatines to what is now Virginia. Ahnentafel #200 - Johannes HENLEIN (d. 1775) - born in Pfaltz, Germany; married Catherine KUHN (dates unknown) and had 11 known children. Immigrated to North America and settled in what is now Virginia. 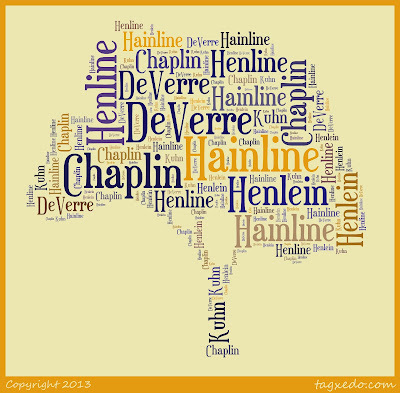 Ahnentafel #100 - John HENLINE (1760 - 1834) - born in Virginia. Wife's name is unknown, but they had six known children. He died in Montgomery Co., Kentucky. Ahnentafel #50 - John W. HAINLINE (1796 - 1861) - born in Montgomery Co., Kentucky; married Mary DeVERRE (1803 - 1871) in 1826 in Clark Co., Kentucky. They had 11 known children. He died in McDonough Co., Illinois. Ahnentafel #25 - Susan W. HAINLINE (1828 - 1914) - born in Montgomery Co., Kentucky. She was the second wife of Gideon CHAPLIN (1821 - 1876), whom she married in 1850 in McDonough Co., Illinois. They had ten children. She continued to run the family farms with her sons' help after her husband died. The family emigrated to Union Co., Iowa and then Cheyenne Co., Kansas, where she died after a stroke a fall. This article originally appeared in my Tech Tips column in Eastern Washington Genealogical Society's quarterly publication, The Digital Digest, the Spring 2013 issue. It has been revised for this post. Do you ever feel inadequate in your computer abilities or intimidated by technology? Are you afraid that you might do something that will damage your computer, ruin your genealogy data, or at the very least, make you look stupid? Some of the most common comments I hear from people in my genealogical society or at genealogy classes I teach are that they don't understand technology, or can't keep up with it, or feel overwhelmed by it. Other obstacles may be budget or time constraints that make it difficult to purchase newer electronics or take opportunities to learn new skills. 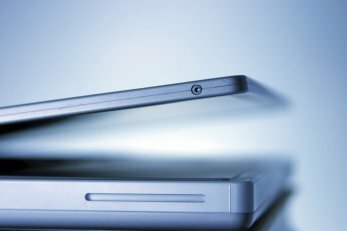 As genealogists, it's important we make an effort to understand technology so that we can utilize it to enhance our research. Digital cameras, desktop computers, laptops, tablets (iPads), printers, scanners, smart phones, MP3 players (such as iPods) and even GPS units are used in various ways that can make gathering, analyzing, and storing genealogical information more efficient. Here are some ideas to help you improve your technological comprehension and aptitude. Read a book or magazine. Years ago, I bought some photo editing software, but really didn't know how to use it. I went to the library and got Paint Shop Pro for Dummies. When I updated my computer to a new operating system, I purchased a Dummies book for it as well. My local library district has many Dummies books as well as Complete Idiot’s Guidebooks for all kinds of operating systems, software, and hardware. They can be found under the 004 and 005 call numbers. These books not only are educational but are often written with humor, and can definitely make you feel like less of, well, a dummy! Another favorite resource is Smart Computing magazine. The articles are written in layman's terms and the consumer reports have been very helpful to me in choosing the best product for my budget. Digital editions of past issues can now be downloaded for free at the link above. This publication is also available at my local library. Take a local class. My local library district offers free computer classes. Additionally, several area senior and community centers offer computer classes for a nominal fee. Finally, my local community college district offers fee-based computer classes through their continuing education and seniors programs. Learn online. Don’t know the difference between DOS and OS? Unsure what a widget does? TechTerms.com is an online computer dictionary. Not only can you look up a term and get its definition, but you can browse the terms by category (Internet, hardware, software, technical, etc.) or even by your skill level (1 through 10). You can take a quiz or read the daily definition. All will help you improve your tech word power. Another great site is GCFLearnFree, which offers free online classes, in print and video formats, in computer, email, and internet basics; Microsoft and Apple features; social media, such as Facebook and Twitter; and tips and tricks. You can set up a free account, take classes, and even get a certificate of completion in each category. Learn from the Developers. Both Microsoft and Apple offer online classes in their products, some for free and some at cost. They range from basic understanding to training and certification. Learn more at http://www.microsoft.com/learning/en/us/default.aspx, http://www.apple.com/retail/learn/, and http://training.apple.com/. Don’t forget to check out the websites of the companies that produce your favorite accessories or programs, such as your printer/scanner or your photo-editing software. Make it a personal--and a genealogy--goal that you will strive to increase your knowledge and skills and not be intimidated by technology. 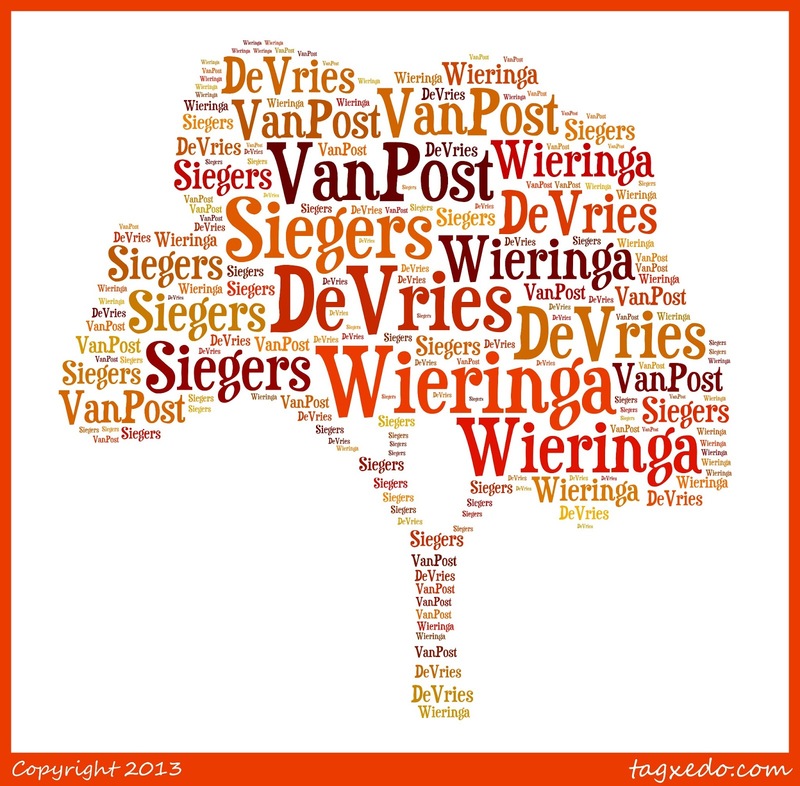 The WIERINGA family is one of the lines of my maternal step-grandfather. I have never thought about my mother's step-father as being a step-ancestor. He raised my mother, tried unsuccessfully to adopt her (her biological father wouldn't sign over his parental rights, although he didn't participate much in my mother's life), gave her away at her wedding, and included her equally in his will with his two biological children. My grandfather had six grandchildren (including my brother, who was named for him) and 12 great-grandchildren, only one of all those being his biological offspring between step families and adoptees. Yet just as he was always my mother's Dad, he was always Grandpa and Great-grandpa DeVRIES to all of us. To honor him and to bless my uncle, aunt, and cousins, I have researched his ancestry. After all, the DeVRIES family history directly impacted my own, and it's likely I would not exist if Grandpa hadn't married my grandmother and raised my mother. 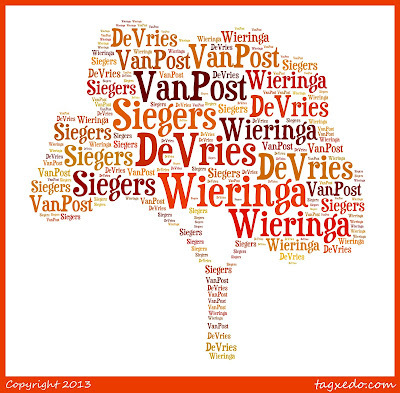 WIERINGA is a Frisian surname that means "the household of Wier," and originates out of the province of Friesland in the Netherlands. Friesland's language and culture is more closely related to that of the English, as they both had the same Anglo-Saxon ancestors. In Europe, the Frisian ethnic group primarily lives in the provinces of Friesland and Groningen in the Netherlands and also in the region of Ostfriesland and district of Nordfriesland in Germany. Ahnentafel #50 - Hendrik WIERINGA (b. 1815) - he was probably born in the province of Groningen, the Netherlands. In 1858, he married Korneliske SIEGERS (b. 1827) in Oldehove, Groningen, the Netherlands. They had at least two daughters.